For rather a long time the local railway bridge has not been keeping the Worcester Park end up as far as putting on a decent welcome to the London Borough of Sutton (if travelling from Kingston) or to the Royal Borough of Kingston if coming the other way. Local discontent has been rumbling on for a while such that a local campaign was set up back in November of 2011 to try to get it sorted out. In March last year when over 100 people had joined the campaign we were promised by local Lib Dems that it was all going to be fixed by the early autumn of last year. The local Lib Dem MP had even sent a letter to Network Rail. Just when all hope seems to have faded the painters in bucket lifters turned up during the recent spate of roadwork and lo and behold the bring has been painted! "I met with Paul Scully at the railway bridge on Saturday morning. 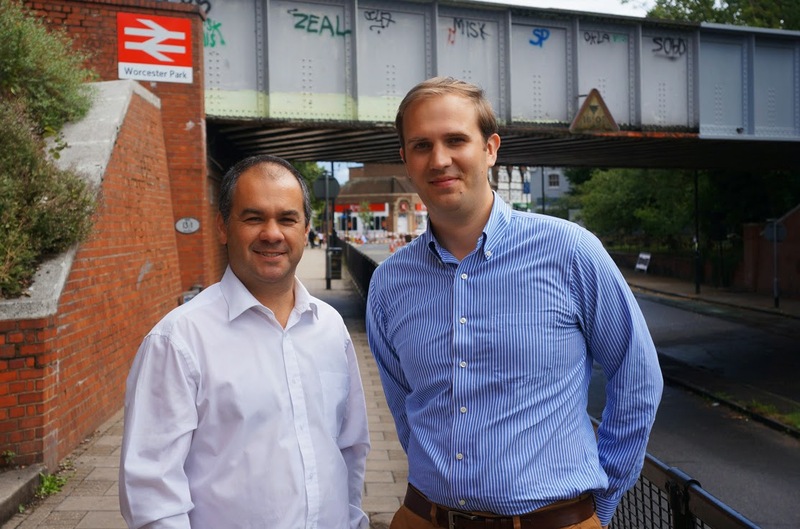 We have contacted the new Chief Exec of Network Rail and asked for a meeting with someone with authority to make decisions about the much needed works as soon as possible." 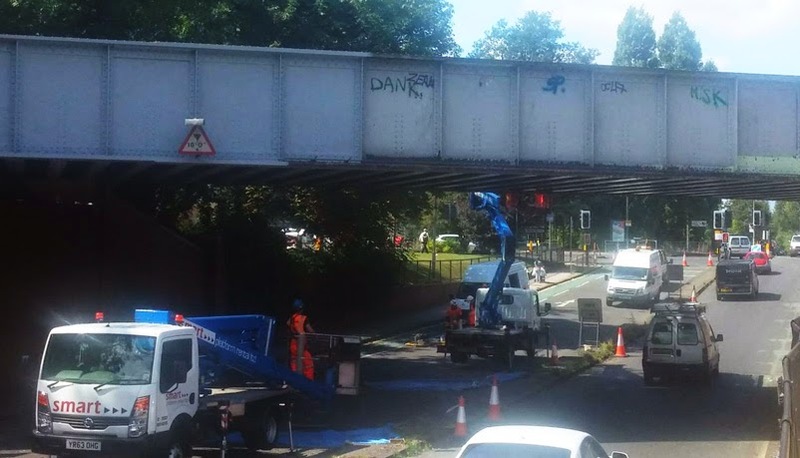 "It's brilliant that the bridge has finally been repainted. The one silver lining of Central Road being dug up again was that Network Rail were able to get on with the repainting after James and I picked up the baton with them. Now we've finally seen some action. The next thing we need to sort out is keeping the pigeons away!" They even managed to paint out those really old light green bits! As many readers have already suggested, it probably won't be long before the mentally challenged graffitists decide to try and seek our attention again by defacing the bridge, so you'd better enjoy the view while it exists in this pristine state. Here's another photo you can use to convince your children's children that it was actually once clean and graffiti clear.